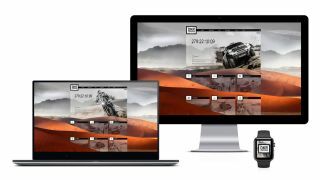 The latest features for Adobe XD for Windows closely aligns the tool with Mac versions. The gap between what Adobe XD can do on Windows and Mac continues to shrink thanks to the software's May update. Bringing the two platforms together is the latest goal of the Adobe XD team, and this release is the first big step in making that happen. Headline features include the highly requested Layers panel and the ability to update shared prototypes. There's lots here for UX designers to get excited about as they'll be able to collaborate more easily, so let's get stuck into the main updates. First up is the Layers panel. You can access it by pressing Ctrl+Y, or alternatively selecting the icon on the lower left-hand-side of the application screen. There's still no news about being able to drag-and-drop layers to change the Z-order, but Adobe promises this capability isn't far off. Next, is the ability to update shared prototypes. In the past users had to create whole new prototypes, but not any more. Simply open the Sharing pop-up dialog, and click Update to share prototypes to the same link you had before. To see your new content, you just need to refresh your screen. Also in the update is a PDF export feature. This builds on the software's previous capability, which allowed users to export to PNG and SVG. Assets can be selected individually, as an artboard or as a group of artboards. Multiple artboards can be exported as a single PDF. The copying and pasting function from the File Explorer also gets an update. It's now easier to import assets, with users able to copy from the File Explorer and paste directly into XD to import the file. Last on the list is increased language support. Extending to support French and German, it looks like XD for Windows 10 is set to be a whole lot more European-friendly.